There are a few possibilities to send maps to your GPS Device. As I assume you are using Garmin Basecamp - the easiest is to just send them from Garmin Basecamp. And fastest way of sending is always to the microSD card - in a cardreader - because most Garmin devices devices don't have fast USB chips. Alternatively for Windows users only - you could scroll down to the explications how to send maps with Mapsource - this has the advantage of having a full screen map selection possibility - while the Mapinstall windows to select the tiles is a bit small. Otherwise there are no advantages. For Linux Users - the easiest is to send maps using Qlandkarte GT - please read the Qlandkarte GT tutorial for that. Last you could generate the gmapsupp.img with mkgmap - then put it on your microSD - there is another tutorial for this, but it's a bit more complicated (only advantage is that it's a bit faster). All maps sent at once will appear as one map on your map selection setup on the GPS device. If you want to be able to switch maps on/off separately, then send them once, and rename the GMAPSUPP.IMG into anything else (well the .IMG needs to stay) - but don't use Umlauts, special symbols or spaces in the name. Then just sent the next map. This makes it very easy to manage your maps. You can simply export map by map and rename it. If you want to upload a new updated map, delete the old map you previously sent, and send only the new map again. This means you need to send all maps at once to the GPS/memory card, maps (except basemap) previously sent will be overwritten. If you want to be able to switch the contourlines on/off on your GPS device, best install it as a separate map in Mapsource/Basecamp, then select first the normal map and delete all 7* (e.g. (73650000)) from the list on the left hand side, and then select the map tiles from the contourlines only openmtbmap. Note - while sending maps with MapInstall is easier and less errorprone - the drawback vs Mapsource is - that the selection window for the map is rather small. Otherwise there is no reason to use Mapsource anymore. 1. b) Insert the memory card of your GPS into a memory card reader, and wait till it is read in in Basecamp. It will show you all previously installed maps (note check if they are called gmapsupp.img - in that case they will be overwritten). Right click the ALL Data folder and click on "Install Maps on ....". 1. c) Click on Utilities --> Install Maps (note this is only active if you have connected a GPS device via USB ) - this is not recommended as map transfer will be very slow via USB on many Garmin GPS. Note in some new Basecamp versions Utilities may not exist anymore. Select all map tiles of the region you are interested in by dragging with your left mouse button clicked over the map. On the right hand side you can see how much space is available. (note this is the only real advantage over Mapsource, which doesn't look for empty space). If you want to send several maps at once, then change the map with the dropdown on the bottom, and also select the maptiles, once finished click on Next, you'll see another confirmation page, and let Mapinstall send the maps to your GPS/memory card. There are some pecularities with the openmtbmap.org to pay attention to: It is not advisable to simply select maps by left clicking if you have contourlines installed. If you have, then you need to select maps by dragging the selection tool while holding down the left mouse button, else you will either send maps without contourlines, or contourlines only to your GPS. If you have not installed contourlines, you can do as you like. Note the checkbox "Include Route Calculation Data." in the lower left corner. It shouldn't be deactivated - else the maps will be sent nonroutable to your GPS device. Also note the "Mapset Name" in the lower left corner - for new generation GPS devices, you should set an easy to identify name for the map. 0. Select the openmtbmap in the drop-down menu if you have not done so already. The drop down menu is to the left of the "+" and "-" button used to zoom in/out. It is only shown if more than one map is installed. 1. Zoom out (best to 30 - 70km on details "Medium" ). You can directly click onto the zoom using the drop-down menu (in above screenshot still set to 150m). Note that there are maps where inside the bracket a number starting with 6 appears (e.g. 63650000) - those are the map data tiles. Those maps in the Maps field where a 7 is appearing inside the bracket are the contourlines map tiles. If you want to send the maps without contourlines, you could now simply mark and delete them from the list. 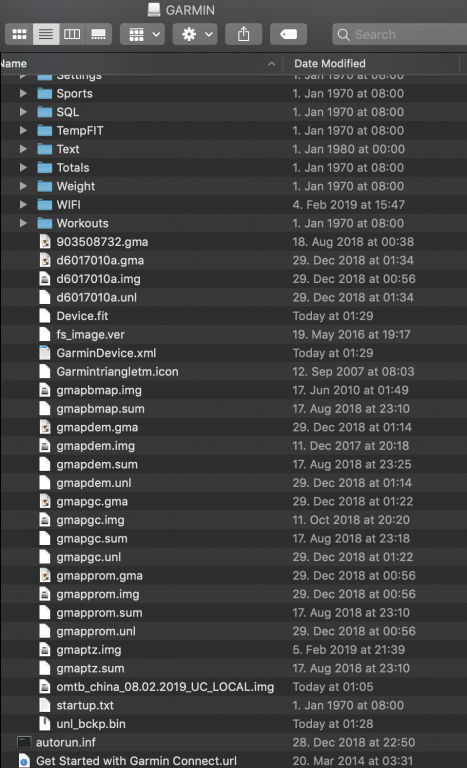 Note: maps previously on your GPS in /garmin/gmapsupp.img (basemaps are saved under a different name) will be overwritten, so include maps previously sent to your GPS too if you want to continue working with them). If the firmware of your GPS is up-to-date most GPS can handle up to 4096MB of maps. Note you can also click instead of drag with the mapselect tool. However if you have installed contourlines, clicking will leave you with either the contourlines only, or the maps only. So if in doubt, drag with left mouse button, and don't simply click/tick to select maps. 5.If you have an old generation GPS (see below for explication) now choose any other mapsets that you wan't to transfer to your GPS (different map in step 0 and repeat to here). Notice that by sending new maps to your GPS all old maps (except the basemap, or the Topographic extended map of Europe for some Colorado/Oregon/Dakota that came with your unit) will be deleted/overwritten. 6. In the top Menu click on Transfer --> "Send to Device". It's fastest to send the maps to an SD/microSD card in a card reader because most Garmin units only support USB 1.1 and not USB 2.0 High Speed - so sending maps directly to the unit connected via USB will take much longer than to your data card. I recommend to send maps to external data cards and not GPS internal memory. I am a very new user of Openmtbmap and I have a problem when I want to install part of my Europe Map on my Garmin Monatana 680 GPS. I’m using Basecamp 4.6.2 and MapInstall 4.0.4, under Windows 10. I make an alloetit caarte for test. The transfer is done normally and I see a file gmapsupp.img on my SD card. When I turn on my GPS I have the message “Can not Authenticate Maps. Contact content seller for help “. If I send map with or Mapsource 6.16.3, it’s same! I have installed the areas of the map i want to on my device but some very large areas aren’t loaded and show up just as dark spot on the map. Also the routes I’ve created don’t show up. It just shows direct lines, not on roads or paths and these occur on the dark areas of the map. Any ideas how to fix this? a) did you maybe select the areas by clicking into the map? You need to drag over the full area that you want to send. The routes need to be planned with exactly the same map as on the device (also same date) – so I think it will solve itself once correctly sent (make sure not to set via points too far from each other). Ich habe BaseCamp (Version 4.6.3 ) auf meinem Macbook installiert und versuche verzweifelt die Kongo-Karte auf mein 64s zu bringen. Es gelingt mir nicht. Unter Karten gibt es den Punkt”Karten installieren”nicht. Kann mir jemand helfen. Vielen Dank! Du kannst MapInstall auch einfach separat aufrufen. Normalerweise taucht es erst dann auf – wenn ein externes Laufwerk erkannt wird – bzw Speicherkarte – oder halt das Garmin Gerät an sich. Bzw überprüfe ob MapInstall überhaupt installiert ist. danke, ich hatte ein downgrade gemacht. Das mit dem Unicode könnte die Ursache sein. Auf dem Gerät sind alle touren drauf. Ich lade eben die Non Unicode english herunter, meine Geräte sind generell auf English eingestellt da wir eine multilinguale Familie sind. Kann ich dann alle Dateien auf dem Garmin welche unter today erstellt wurden wieder bedenkenlos löschen? Die Contouline ist unabhängig von Unicode? Contourlines sind unabhängig. Du kannst alle .img Dateien die heute erstellt wurden wieder löschen – dass sind die Karten. In anderen Ländern sind die Non Unicode local brauchbar – in China und Japan nur wenn man ein asiatisches Garmin Gerät/Firmware hat glaube ich (und halt die Characters lesen kann – ich persönlich bräuchte ja hanyu-pinyin (da ich halbwegs gut verstehen/sprechen kann, aber hanzi aufgegeben habe), aber das bekomme ich leider nicht erstellt). Welches GArmin Gerät hast du? Du hast die Unicode Karte installiert – evtl brauchst du die Non Unicode Version (bei China ist die leider sehr blöd – es geht wenn wohl nur die English Non Unicode). Habe nun die Downgrades durchgeführt. Konnte laut Mapinstall die Karten erfolgreich installieren, das Garmin als auch Bootcamp und GarminExpress erkennen die Karte jedoch nicht.